Many thanks to Suhail, the reader who brought to my attention the wonderful word Dahlesque. When you were a kid, you probably read lots of books by Roald Dahl (1916-1990), so you remember James, his giant peach, and his abusive aunts; Matilda, her telepathy, and her abusive parents; George, his marvelous medicine, and his abusive grandma; and--let's break the pattern just a bit--Charlie, his chocolate factory, and his crippling poverty; and Sophie, her labeled jars of dreams, her orphanhood, and her run-ins with child-eating giants. Things that echo that kind of infuriating cruelty to children, or that kind of whimsical impossibility, or both, are Dahlesque. Dahlesque is pretty new: it first appeared in print in 1983, and it earned a place in the Oxford English Dictionary in 2016. Let's recall a similar word that first appeared in print in 1947: ____esque. It means "scary, bizarre, and dreamlike," in a way that reminds you of stories by an author who lived from 1883-1924--stories both weird and terrifying. In one, a man gets arrested and killed by the government for no particular reason. In another, a man turns into a giant cockroach. Something Dahlesque reminds you of something in a Roald Dahl story, because it's strange and imaginative, full of dark humor, and/or related to adults being horribly cruel to children. Proper adjective: you always capitalize it. 1. Right before a noun, as in "a Dahlesque thing" or "a Dahlesque person." Because this word is so new, because it can be misheard as "doll-esque," and because not everybody is familiar with Roald Dahl's work, it's probably best to use it in your writing rather than your conversations. That is, unless you're sure your listeners will understand it. We often use this word to describe works of fiction that remind you of Dahl's: Dahlesque characters, Dahlesque elements, a Dahlesque tone, mood, style, or flavor. But we can also use this word more generally to talk about real life: Dahlesque exaggeration, Dahlesque whimsy and delight, Dahlesque humor, Dahlesque peculiarity, etc. You might remember from Dahl's stories all those crazy invented words (like "scrumdiddlyumptious") and the dark and rollicking poems ("And cannibals crouching 'round the pot, / Stirring away at something hot. / [It smells so good, what can it be? / Good gracious, it's Penelope]"). With that in mind, you might talk about Dahlesque creativity, Dahlesque wordplay, Dahlesque rhythms and rhymes, etc. Finally, a spoiler alert: Dahl's stories for children usually end well. The miserable kids get happy endings; the abusive adults get what's coming to them. So we might also talk about Dahlesque justice, fairness, or retribution. I love a good Dahlesque story that seems like realistic fiction until, near the end, some magical transformation takes place. How proud he is of his sleazy business sense; how oblivious he is to his own ignorance; how puffed-up he gets and how he loves to put others down. He's a Dahlesque villain, through and through. Look away from the screen to explain the definition in your own words. You’ll know you understand what "Dahlesque" means when you can explain it without saying "quirky" or "dark." Fill in the blanks: "There's a bit of Dahlesque humor in _____, when _____." Example: "There's a bit of Dahlesque humor in Frozen Fever, when we see the villain Hans still wearing his princely attire as he shovels manure." Designed by Eric Goldberg, Ben Grossman, Steve Marsh, Steven Marsh, Vincent Tsao, and Nikola Vrtis, this game has players grabbing power as they attempt coups and assassinations. The game's title means "a small group of people that takes control of a country and then rules it, or more generally, a group of people working toward a goal together (often a political goal)." It's pictured below, with the title blurred out. What game is this? 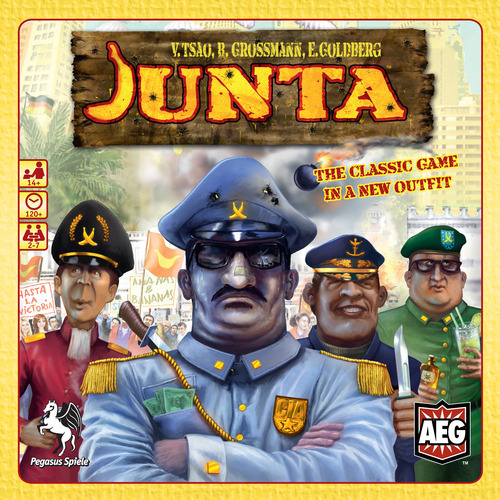 Answer: Junta. Check out the game here and the word here. A. a reversal that leaves us feeling cheated--if it was all a dream, why did we bother? B. blatant, gloomy discussions of the blatant, gloomy theme. C. poetic justice heaped on cartoonish villains.